The lands of the White Stallion Ranch have been inhabited for hundreds of years, long before the ranch ever existed. The mountains were home to the Hohokam Indians. And evidence of their life can be seen in the morteros (mortars), ground out holes in hard rock that served as grinding stones for corn or mesquite beans, and in the petroglyphs drawn on rock faces in the adjacent Saguaro National Park. Originally named the CB Cattle Ranch, the ranch was built in 1900 and constructed of Mexican adobe brick, a building material consisting of mud and straw. During a renovation, workers discovered wire and horseshoes in the walls. A portion of the original adobe is on display in the dining room - the original building on the ranch. David Young was the first deeded owner of the property and homesteaded it from 1936 until 1939 before Herbert and Vine Bruning purchased the ranch in 1939 to ranch cattle, chickens, and turkeys. They changed the name to CB Bar Ranch, where it was once home to 30,000 birds. 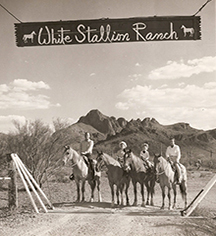 In 1945, Max Zimmerman, a Chicago liquor store owner, bought the ranch and became part of the strong guest ranch industry in Tucson. Zimmerman named the ranch the MZ Bar Ranch, constructing six buildings, complete with kitchenettes, for guests. These building are still used today as guestrooms 1 to 12. Mary Varner purchased the property in 1949 and continued to operate it as a guest ranch; she also offered long term rentals to the nearby Marana Army Airfield. Brew and Marge Towne, of Cape Cod, Massachusetts, fulfilled their dream of owning a guest ranch in 1959. It was re-named White Stallion, even though Black Stallion was the originally desired named. After quickly realizing that “BS Ranch” sported a negative connotation, the White Stallion name has stood the test of time. In 1965, Allen and Cynthia True came from Colorado to make the ranch their home, with sons Russell, just five years old, and Michael, still in a crib. The ranch consisted of 17 rooms, 17 horses, and 200 acres. As casualties of Tucson’s Urban Sprawl, the number of guest ranches in the area dropped to about 30. With an eye toward the future, the Trues began purchasing adjacent land as it became available, increasing the ranch property to 3,000 acres. Today, White Stallion Ranch offers 41 guestrooms and a four-bedroom hacienda, with many of the original buildings still in use. The True sons, Russell and Michael, have expanded the property to include additional active and relaxing amenities, including sunken tennis courts, a movie theater, pool and hot tub area with a serenity patio, lighted sport courts, spa area, and fitness center. With its unparalleled horseback riding program, White Stallion has established one of the largest privately owned herds of horses in Arizona. Since the early days as a backdrop in Western feature films, and later as the location for the television series High Chaparral (1968-72), White Stallion has consistently attracted the attention of Hollywood filmmakers. The ranch played host to the famous 1950 Western Winchester 73, and George Clooney filmed and stayed at the ranch when he made the 2002 blockbuster, Confessions of a Dangerous Mind. Past sets built and used on the ranch can be viewed with the "Movie Pass." A special “Movie Hike” is provided once a week, to give guests a detailed history of the famous film locations on the ranch. 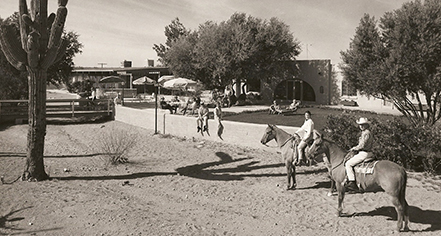 White Stallion Ranch, a member of Historic Hotels Worldwide since 2016, dates back to 1900.